Bird Feeders Made in the USA by Looker Inc. Our clients include over 650 specialty stores nationwide. Looker is a leading manufacturer of Miscellaneous. Hangs with screw eye or mount with screw. 2-1/4" deep and 14" in diameter. Color choice is clay SE705 or green SE704. 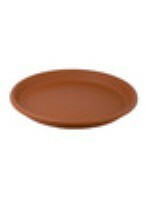 Will also fit our Heated Bird Bath for a summer pan. 1-5/8" deep and 17" in diameter. Color clay is SE706 and sandstone is MS06S. 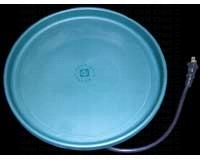 2" deep and 20" diameter. Color Green is SE503 or Clay is SE502. Having to refill the bath at least once a day is normal. These stakes fit over the feet of our posts to hold them securely in the ground. They are powder coated black to prevent rust. They come with all our posts, and all our bird baths with posts except for the Mini. Anchors in ground approximately 12-1/2". Repair houses with holes that have been chewed or chipped away by squirrels, woodpeckers, and other rascals.